At 8:30 last night I was so tired I couldn’t think. I decided I could wait until this morning to write the post. I fell into a sound sleep immediately then woke up at 3:39, wide awake. I took some time to organize my photos but tried to go back to sleep. Finally, at 6, with the sun coming up in my window, I’ve given up. It was a day full of adventures, some known as getting lost, others as not paying enough attention to details..
First, the garden. 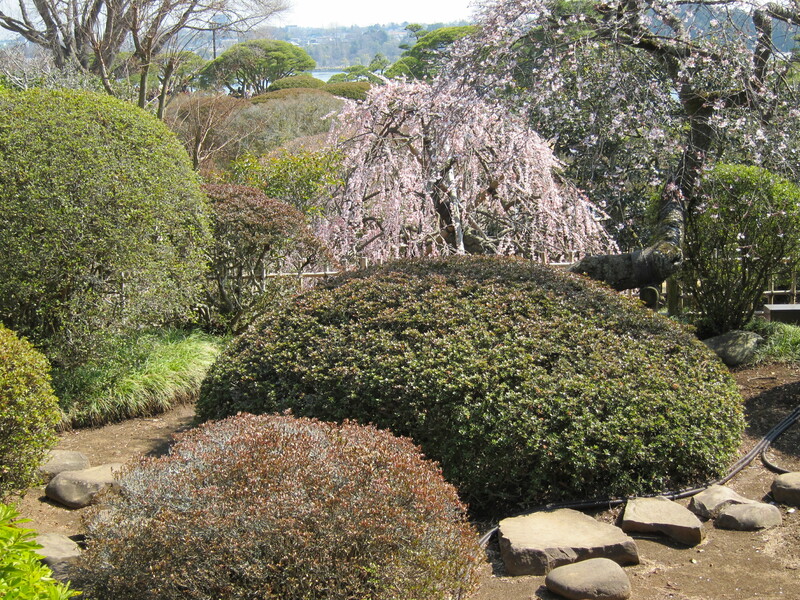 Kairakuen is classified as one of the three top gardens in Japan, the only one I hadn’t visited. It is located east of Tokyo and at the edge of the tsunami area from 2011, but seems to have suffered little or no damage. 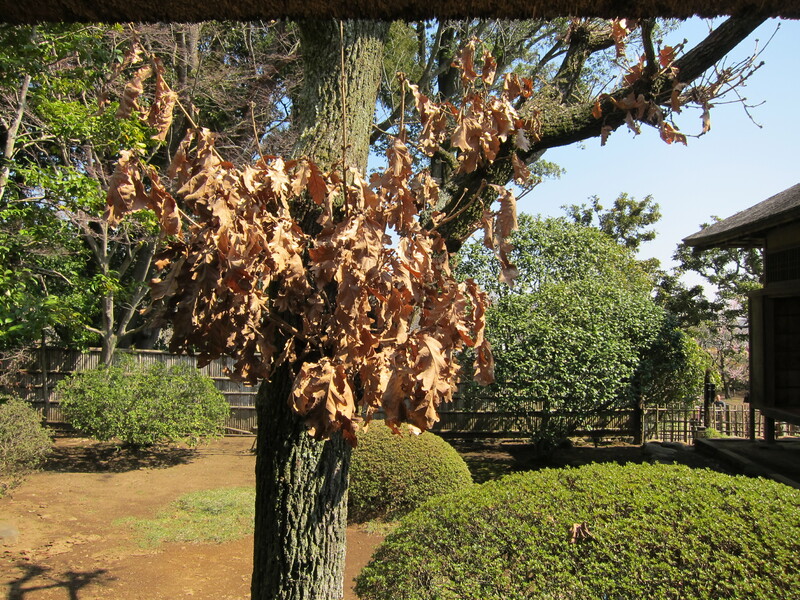 Kairakuen was built for not only feudal lords or feudal warriors but also for commoners. 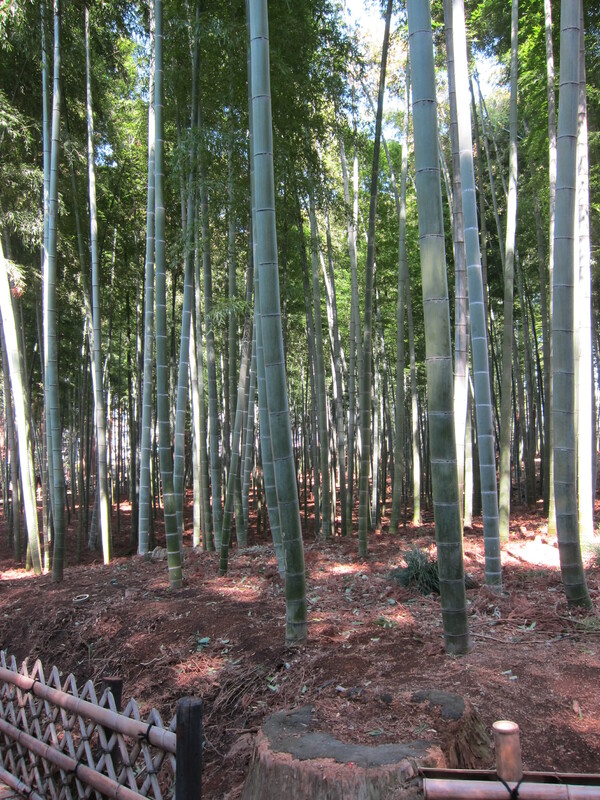 Therefore the design incorporates characteristics from modern parks as well as formal Japanese landscape gardens. 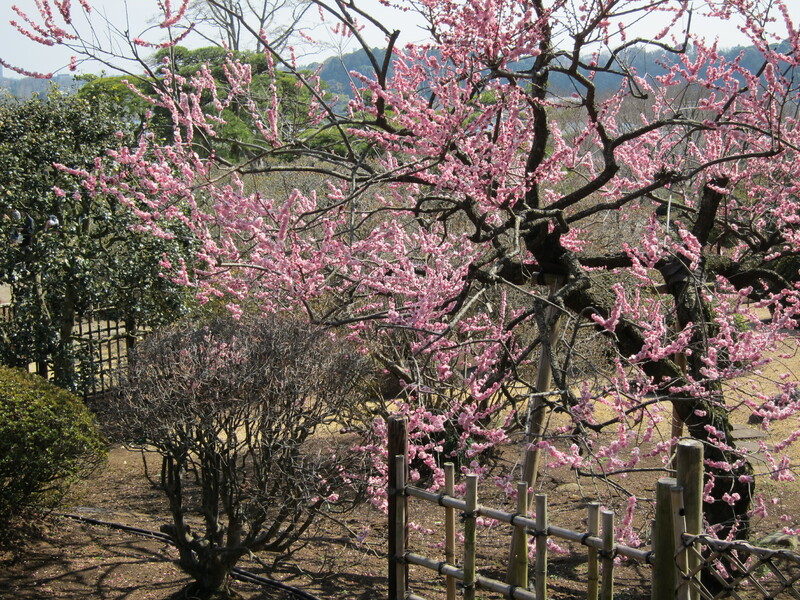 In early spring about 100 different types of plum trees bloom with a total of 3000 flowers making Kairakuen one of the three most famous parks of Japan. It was created in the 1800’s by the ninth (and last) feudal lord of the Mito clan, Nariaki Tokugawa , who may have been motivated as much by the problems faced by the soon to crumble Tokugawa rulers as by any inherent altruism or generosity. 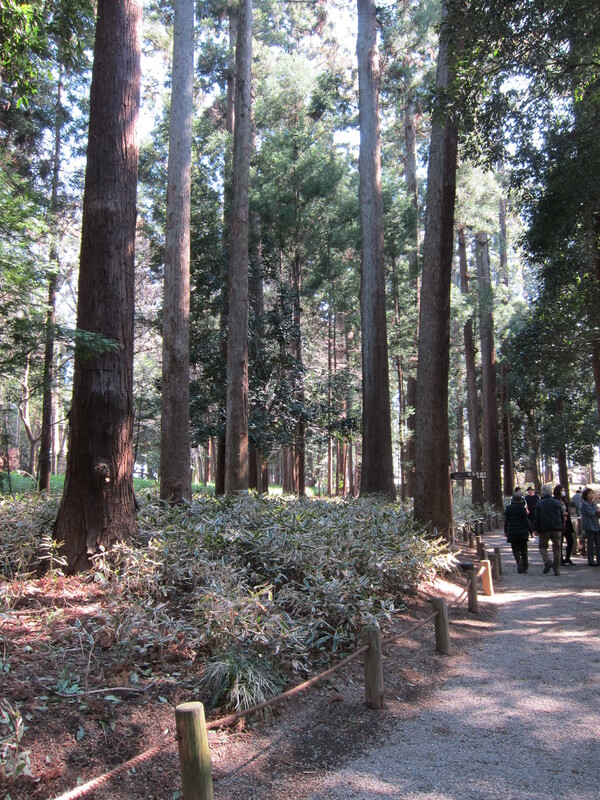 In addition to acres of plum trees the park has a small cedar forest with wonderful old trees, a bamboo grove and cherry blossoms. There is a structure called the Kobuntei and a tea house. 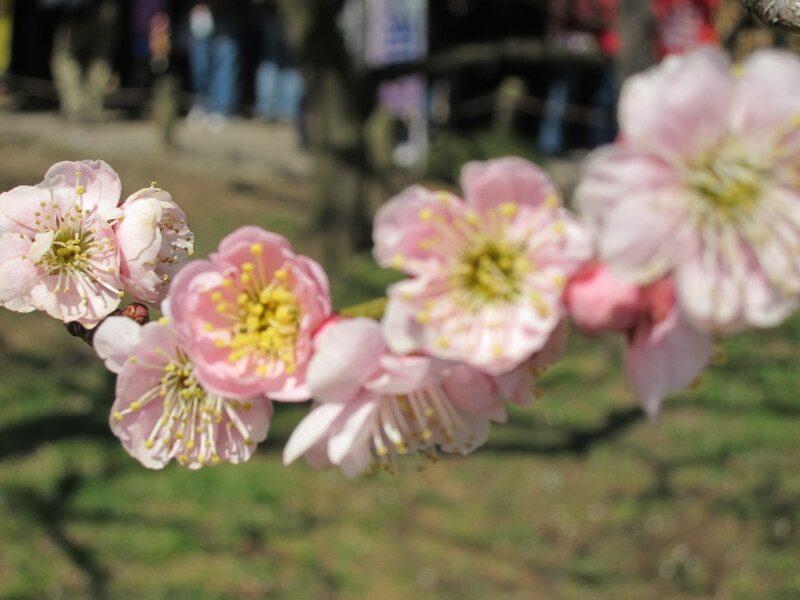 This is the time of the plum blossom festival, ume matsuri. My original plan was to go on Tuesday, hoping it would be less crowded than on the weekend. As I watched the temperature rise in Japan I became worried about how long the blossoms would last, so I decided to go there first. There were plenty of blossoms, which have a lovely fragrance. They are beautful flowers, but small and with limited coverage of each branch, unlike the cherry blossoms that give the impression of being all over the tree. 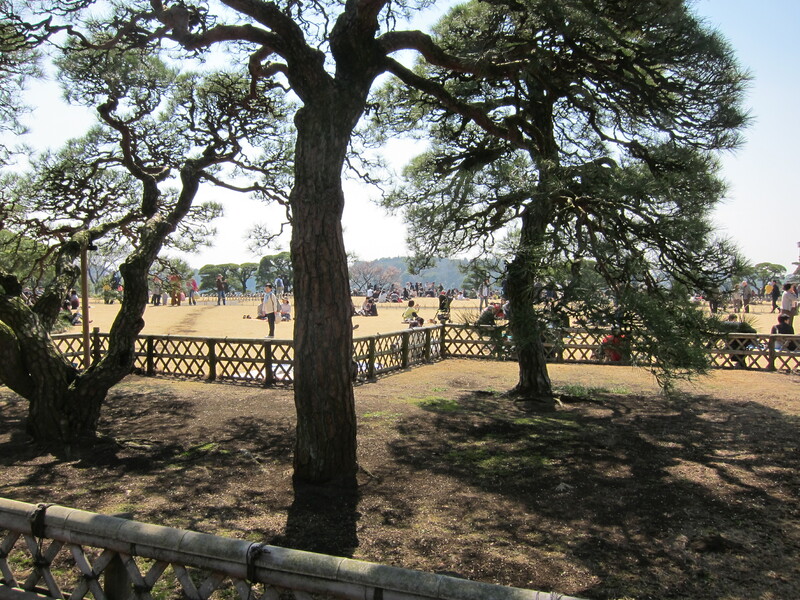 As you can see the trees are planted with lots of space around them. The ground looked barren to me until I realized I was walking on a ground cover of pine needles. 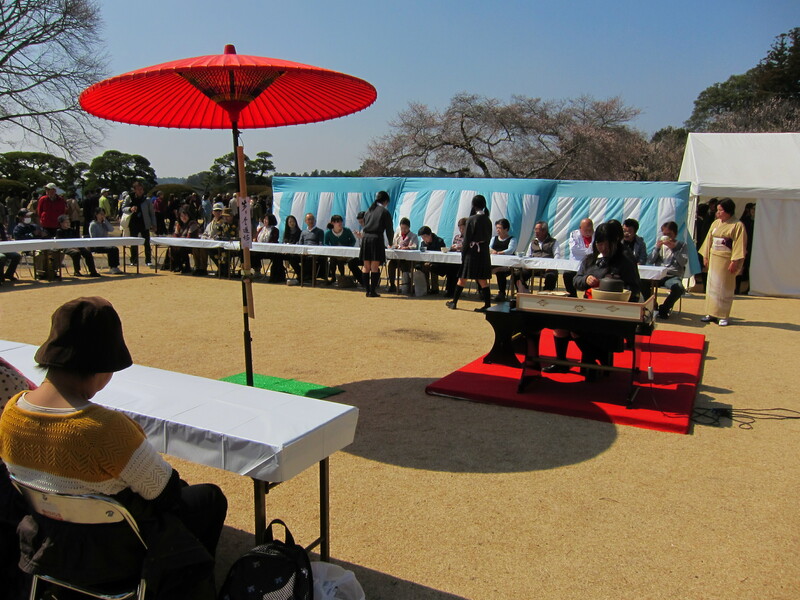 The festival includes an opportunity to attend a mammoth tea ceremony. The woman in the center is showing how to make the tea. Actual bowls of tea to drink are brought from a tent behind her. Each person is presented with a bowl, along with much bowing. The bowl is removed after a reasonable time for drinking, again with much bowing. Another long line was to have your picture taken with some people in costume. I’m not sure who they represented. 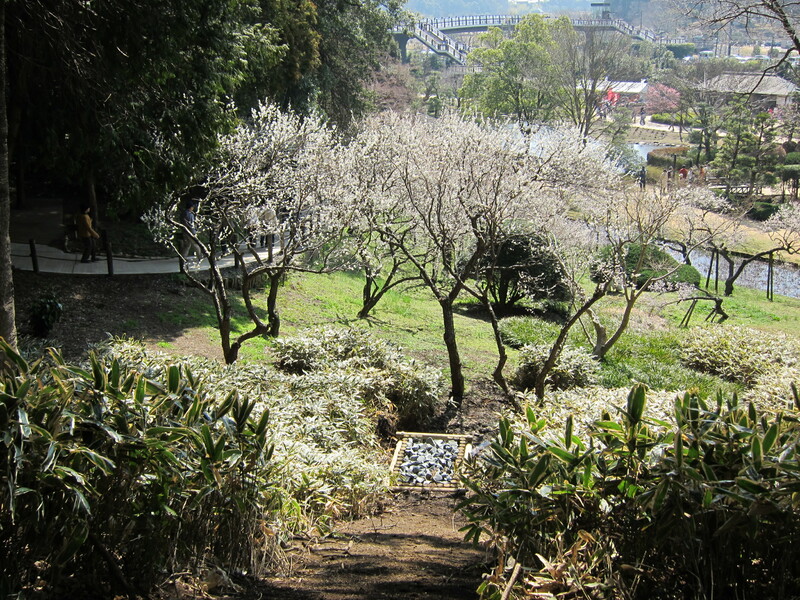 At the top of a gentle hill were several vendors selling perfume (plum blossom? ), those ubiquitous gift boxes I am convinced line the closets of every home in Japan and another long line; this time to enter the Kobuntei, the structure built by Nariaki to entertain writers, artists and residents of his domain, where he would have poetry composing parties and other events. 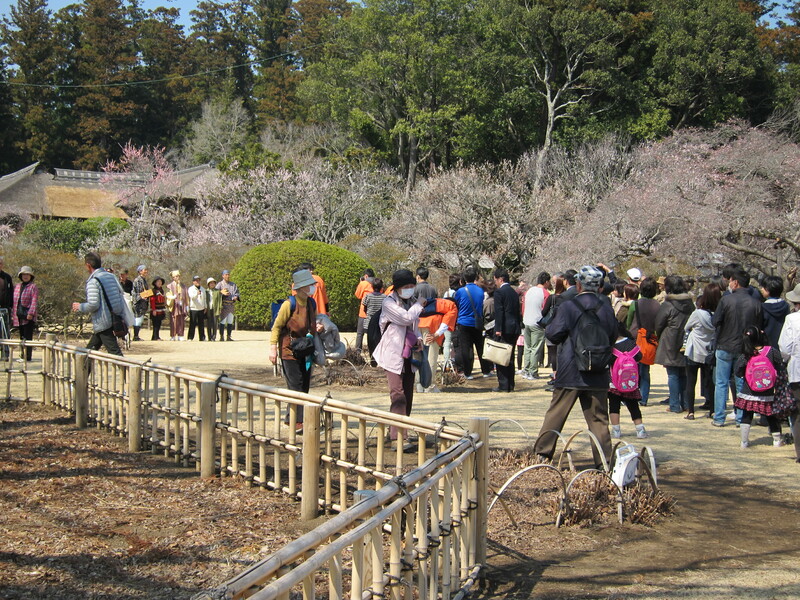 I don’t like standing in line but I got in that one and enjoyed seeing the building and the garden surrounding it. I did a lot of walking. There is an elevated train station very close to the hotel. Originally I walked right past it since it looks like just another building. When I finally found it I had to climb several flights of stairs to get to the station, which is old, several blocks long and might have an escalator or elevator at the other end. I knew the train was close and when I booked the hotel I thought I might be able to take the train , walk to the hotel and avoid a taxi ride. Reality hit when I arrived on Friday night. The airport train takes you to Tokyo station, a huge transfer point for many local trains. I would have had to transfer twice from there. Remember, I am dragging two suitcases on wheels, one in each hand. I found the nearest exit and got in the first taxi. I had a printout of the reservation that had some Japanese on it, but not enough. The taxi driver couldn’t figure out where to go. He finally stopped at a police box and got directions. It cost me about $14 and might have been the best $14 I ever spent. I never would have made it to the hotel with all those stairs. I am ready to face my Sunday adventures, so more of all this later. 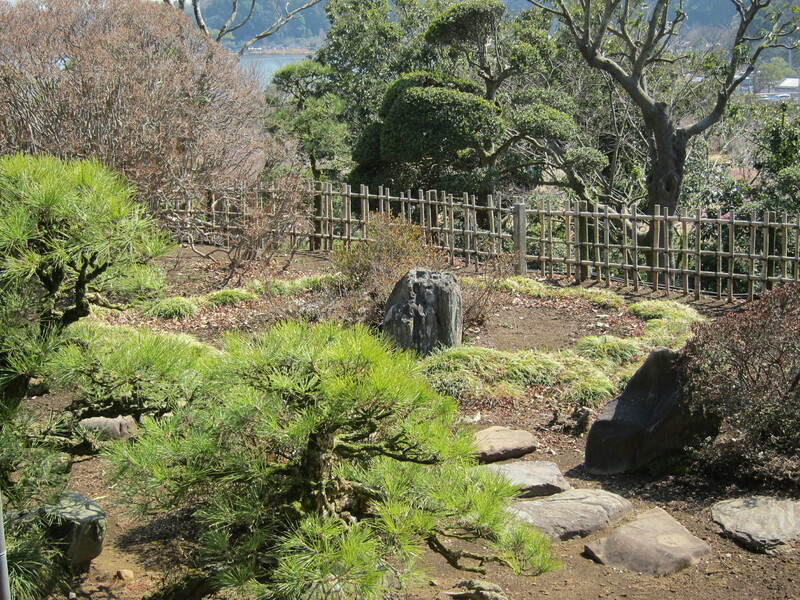 This entry was posted in Garden, Japan, Japanese Gardens, Walking by ruthek. Bookmark the permalink. My feet were hurting and I’m just sitting here in my chair! I like both those doctrines! 😀 Almost as much as I like those pink blossoms. Beautiful beginning. It wasn’t my feet. I took care of that with a visit to a podiatrist. It’s my legs and hips that give me grief. Always remember the NYC doctrine: When in doubt, opt for the cab. Things seem to be off to a fabulous start!